This is an excerpt from my upcoming book, BLOOD, SWEAT, AND PIXELS, which comes out on September 5. You can pre-order the book at your favourite bookstore. A few miles away, at the Irvine Spectrum outdoor mall, the rest of the Diablo III team had no idea that people couldn’t play their game. They were busy partying. Hundreds of hard-core fans, dressed in spiky armour and carrying giant foam battle-axes, had come out for the official Diablo III launch event. As Blizzard’s developers signed autographs and passed out swag to the crowd, they started to hear whispers about overloaded servers. Soon it became clear that this wasn’t a standard launch hiccup. Since Blizzard’s founding in 1991, the studio had developed a reputation for making fantastic games, including the cultural touchstones Warcraft and StarCraft. When you saw the jagged blue Blizzard logo attached to a game, you knew you were getting something unparalleled. With Diablo II in 2000, Blizzard had developed the definitive action-RPG, a game that inspired countless all-nighters and LAN sessions as millions of teenagers gathered to battle disfigured demons and hunt for elusive Stones of Jordan. Diablo II was widely considered one of the best games ever made. Now, in May 2012, the rocky launch of Diablo III had associated the Blizzard logo with something that the company had never experienced: public failure. And even after Error 37, the problems were just getting started. Mosqueira said he’d have to think about it. He looked out his window, watching the snow fall, and realised there wasn’t much to think about. “Fast forward two and a half months, and I find myself walking into these halls as the lead designer for the console version of [Diablo III],” Mosqueira said. His job was to direct a very small team—three, at first, including him—that would adapt Diablo III for the Xbox and PlayStation. This was a surprising initiative for Blizzard, which for years had resisted releasing games on consoles, instead choosing to put out massive hits like World of Warcraft and StarCraft II only on PC and Mac. With Diablo III, Blizzard’s brain trust finally saw an opportunity to explore the giant world of console gaming. 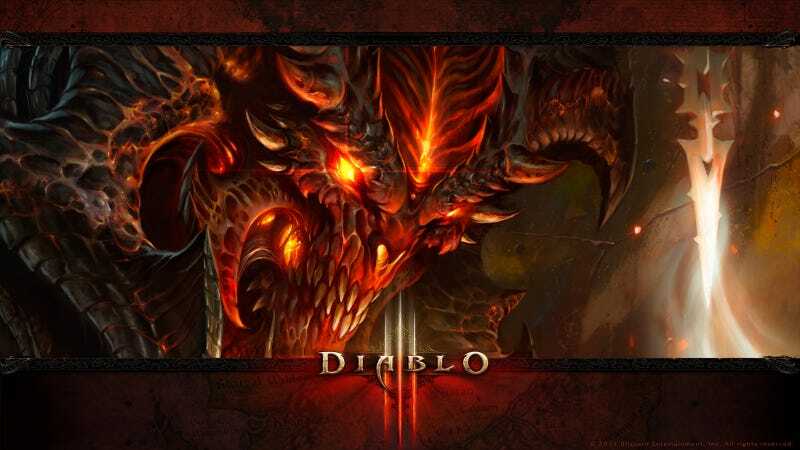 Then came Diablo III’s launch, and Error 37, and manic days at Blizzard in May 2012 as they tried to stabilise the servers. 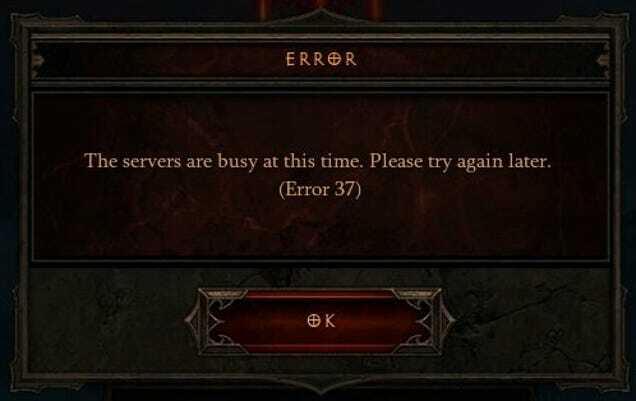 While Mosqueira and his crew went back to work on the console version, Diablo III’s other designers began trying to solve the game’s deeper problems. Players clearly weren’t happy with the loot system, for example, but what precisely was wrong with it? How could Blizzard make the endgame as addictive as it had been in Diablo II, where players spent hours and hours fighting through demons and hunting for gear even after they’d already finished the story? The biggest problem, the developers realised, was the game’s difficulty. 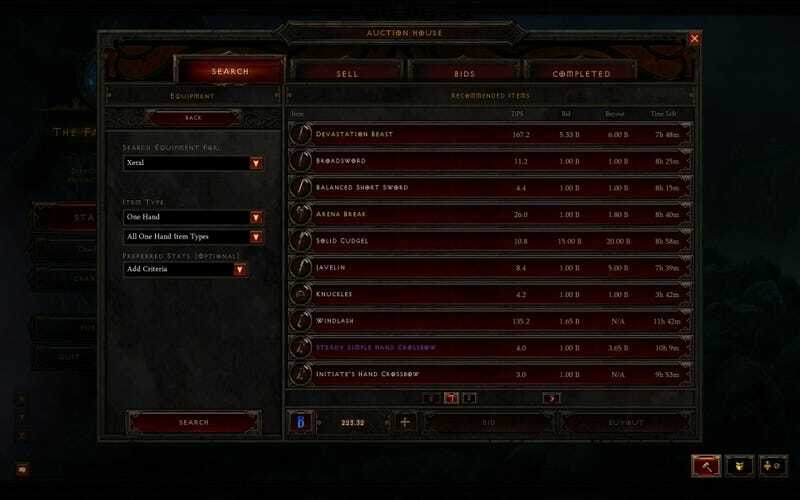 Blizzard’s designers had originally built Diablo III’s difficulty system to mirror Diablo II. You’d play through the full game once on Normal mode, then play it a second time on the challenging Nightmare mode, and crank through a third time on Hell mode. 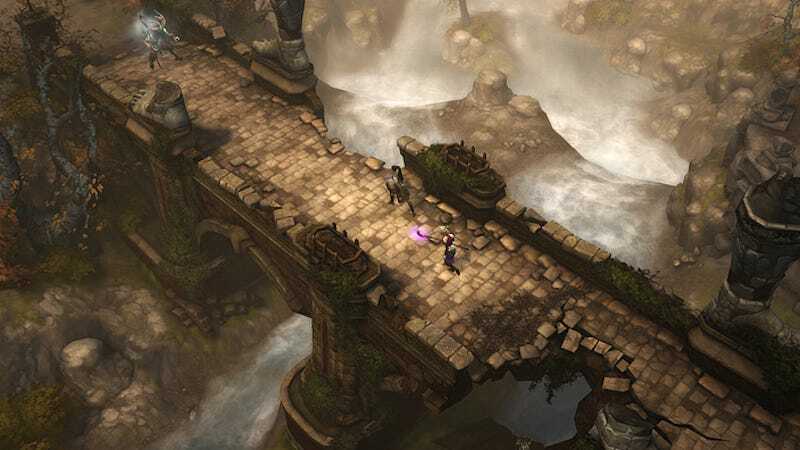 Diablo III repeated that structure and introduced a fourth difficulty option, Inferno. Designed for players who had already hit the level cap, Inferno was blisteringly tough, to the point where you couldn’t beat it without the game’s best gear. But Diablo III’s best gear dropped only when you played on Inferno mode, creating a nasty, demonic version of the chicken-and-egg dilemma. How could you get Inferno gear if your gear wasn’t good enough to get through Inferno in the first place? There was one option: the auction house. If you didn’t want to bash your head against the wall in Inferno mode, you could dish out real money for better gear, which was the exact opposite of what most players wanted to do. As a result, some crafty players found ways to abuse the system. Thanks to Diablo III’s random number generator, the chances of getting loot from a powerful enemy weren’t much better than the chances of getting loot from smashing a stationary pot. Once players realised this, they’d spend marathon sessions doing nothing but breaking pottery. It wasn’t particularly fun, but hey, it beat giving away real money. Where BioWare’s Dragon Age: Inquisition team was bedevilled by negative reactions to Dragon Age 2 (see chapter 6), Blizzard had the opposite problem: Diablo III had to surpass Diablo II’s massive success. 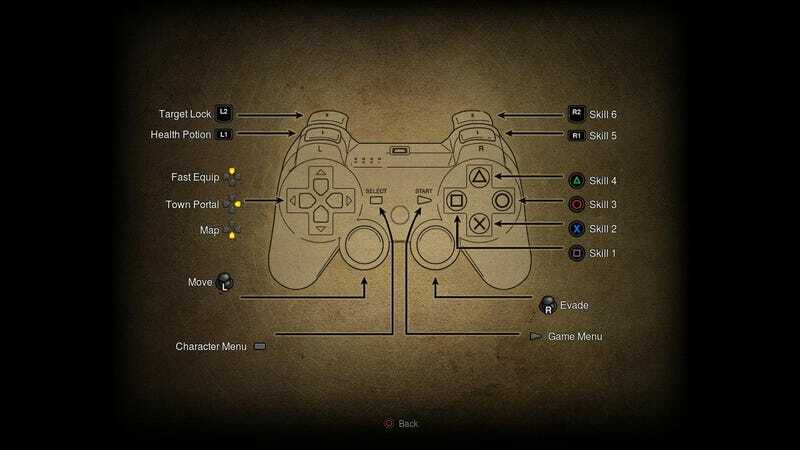 The designers of Diablo III had been willing to make big innovations in some areas, like the flexible skill system, generally considered a highlight of the game. But, in Mosqueira’s view, they were too rigid about other series traditions. 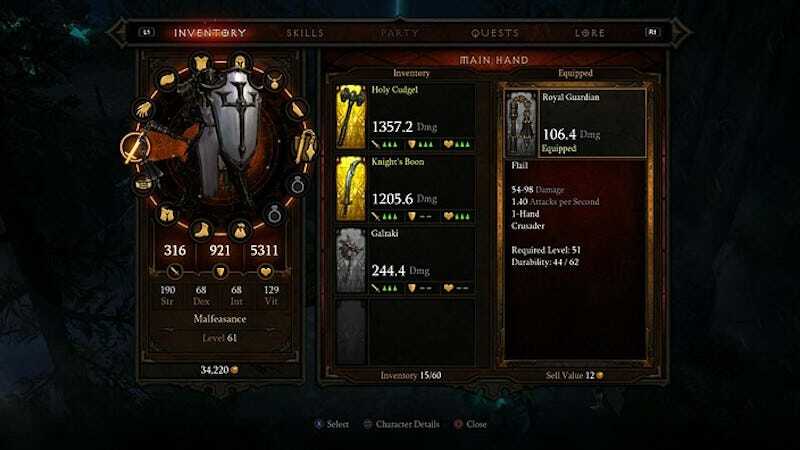 For a game that had been in development for so many years, a fresh perspective could be useful, especially when Blizzard began reexamining core parts of Diablo III, like the loot system. 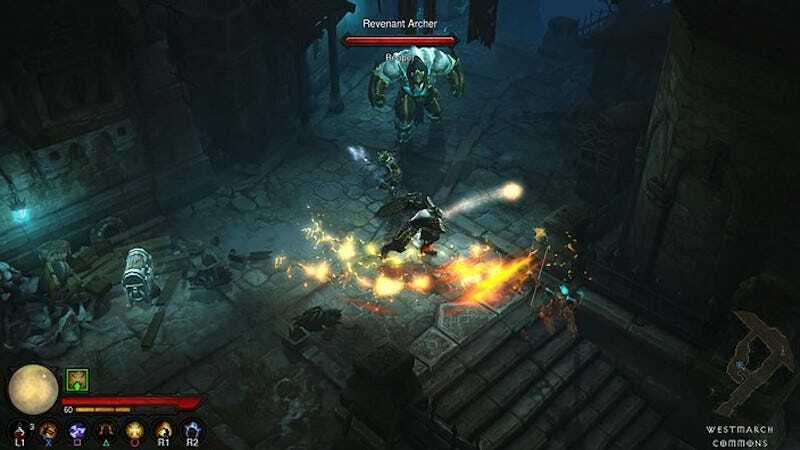 In the PC version of Diablo III, enemies would spawn fountains of loot when they died, offering that familiar dopamine rush for players as they picked up cool new weapons and accessories. But without a mouse and keyboard, sorting through all those glittering rings and amulets could be a chore. As the Diablo III console team playtested the game, Mosqueira found that this loot overload was impeding people’s progress, forcing them to stop every few seconds just to organise their inventories. They would call this new feature Adventure Mode. Once you’d finished Reaper of Souls, you could open up this new Adventure Mode and jump into any area of the game, from the deserts of Caldeum to the frozen peaks of Arreat. Each of the game’s five acts would give you a series of randomised bounties like “kill a boss” or “clear a dungeon,” and the more bounties you completed, the more loot you’d snag. 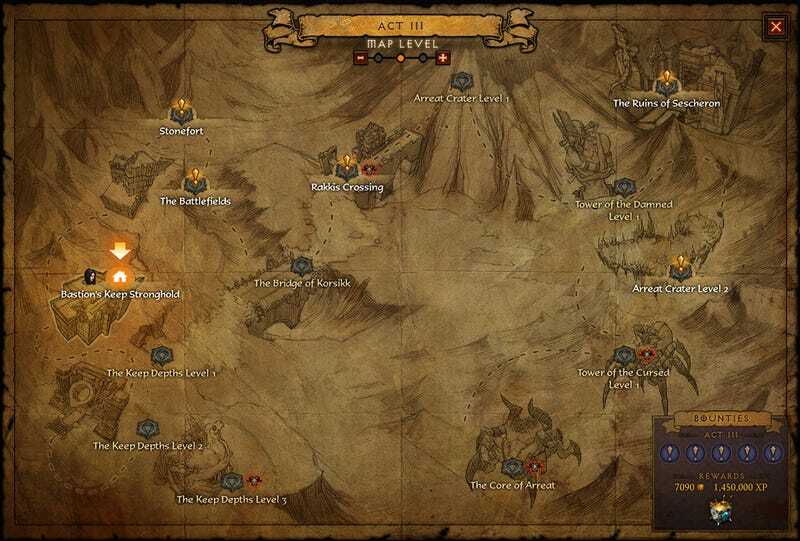 Adventure Mode would also add special events and what the game called “Nephalem Rifts,” multitiered dungeons that shuffled areas and monsters from all throughout Diablo III like some sort of gothic mixtape. As Blizzard envisioned it, Adventure Mode would entertain players for hours and hours once they’d finished the game. It sure beat smashing pottery. In August 2013, at the Gamescom trade show in Germany, Blizzard prepared to announce Reaper of Souls to a packed room full of reporters and fans. This expansion would centre on the demonic archangel Malthael. It would come with a new class, the crusader. And it would introduce all sorts of features, starting with Loot 2.0, in a free patch that Blizzard hoped would signal that the developers of Diablo III were listening to the complaints. Originally, Blizzard had planned to put out Reaper of Souls later in 2013, but the Diablo III team realised they needed more time, delaying it to the first quarter of 2014. This was a surprise to just about nobody. Blizzard had a reputation for taking its sweet time with games—Diablo III had taken ten years, after all—and you’d be hard-pressed to find a Blizzard game that hadn’t missed at least one deadline. When Blizzard first announced Diablo III’s real-money auction house, cynics saw it as a cash grab. After all, Blizzard got to take a healthy cut every time a player sold an item for cash. Blizzard’s developers argued that they had more noble motives, insisting that they’d built the auction house to improve the experience of trading items for players. Back in 2002, Diablo II: Lord of Destruction had become infested with third-party grey markets, in which people would trade real money for powerful items on sketchy, insecure websites. Blizzard’s goal was, as Kevin Martens put it, to provide “a world-class experience” for those players, one that was safe and secure. Not long after Diablo III’s launch, however, it became apparent to Blizzard that the auction house was hurting the game. Some players enjoyed trading, sure—especially the ones who were farming loot and selling it for a healthy profit—but for many, the auction house made Diablo III a significantly worse experience. It reduced the thrill of hunting for gear. What was the fun in getting a great roll on a cool new piece of armour if you could just hop on the market and buy a better one? Now it felt like they’d found the perfect formula for Reaper of Souls. In addition to the new area (Westmarch), and boss (Malthael), the expansion would come with Loot 2.0 (free to all players via patch), Adventure Mode, and an overhauled difficulty system. The week before Reaper of Souls, Blizzard would remove the auction house. As they finalised the development of the expansion and prepared for launch, Mosqueira and his team felt like this was the big moment. They were going to win people back.